I love these jars too. They can be hard to find at a good price though. I love the look of them filled with vintage collections like old yardstick rulers or vintage brushes. Have a great weekend Kym. Yep, these are on my list of things to buy too, but like Kristine has commented, they can be pricey. They do look lovely in a bathroom. Good luck with your search. They look great dont they? I would love to have them in my bathroom too but I fear my cherubs would knock them over with their hair straiteners, make up, hairdryers etc etc. One day maybe!! Im with you Kym, I would also love some in my bathroom on a ladder shelf, but have yet to come across some at areasonable price!!!! Oh my goodness, they are all so divine aren't they. I can see why you love them. 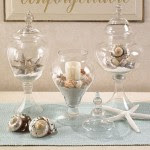 Hi Kym, I love your post because I love apothecary jars! I have them in my bathroom, living area and I want to get some for my laundry when I renovate it, to hold my washing powder etc... I have managed to get some at great prices from Target, Provincial Home Living and Brown Button Trading. I think Harvey Norman also have some larger styles but they are a bit more pricey. Good luck with the search and let me know if you come up with any bargains! Looking forward to seeing what you do with them in your home. They're great aren't they? Perfect for displaying shells, sweets or storing cotton wool etc. 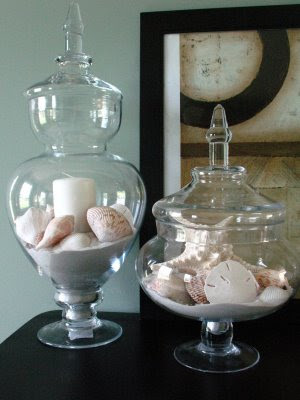 love apothecary jars! i only have one and it is filled with sand and starfish...similar to your last photo. 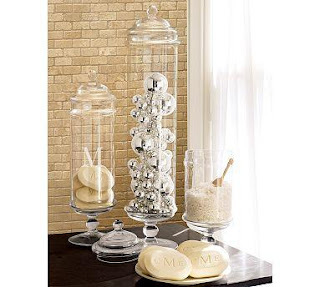 The apothecary jars are gorgeous. Thanks for showing all the different ways to use them! I love these! I've wanted to get jars like this. Pottery Barn has some great ones!